There’s a lot to be said about the new Doug Ford-led Conservative administration in Ontario, but it is Ford’s unilateral and radical reduction of the size of Toronto City Council in Bill 5, the Better Local Government Act, that has drawn much of the initial attention and opprobrium. We need to consider the reaction to it from the local left and how the new situation may open up a new terrain for the socialist left to intervene in the October 22 Toronto election (and other local elections across the province). Despite the initial dissent from expected quarters – political junkies, the so-called ‘downtown elites’, community activists, this opposition will not necessarily damage Ford. Even if these measures are authoritarian and anti-democratic, as with Trump, Putin, and many others in this political moment of right-wing populism, they will not necessarily hurt Ford. 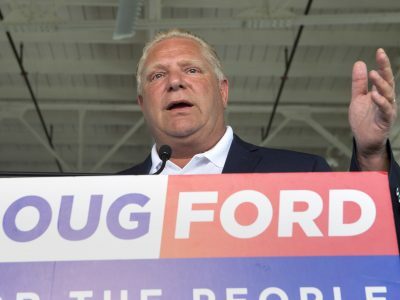 And, behind the “dysfunctionality” rhetoric that Ford invoked to justify the attack on the representative structure of Toronto’s council, his real intention has less to do with savings, efficiencies and better decision-making and more to do with ensuring a council with a strengthened hard right, neoliberal element. That being said, the Ford attack on Toronto’s local democracy is ‘meat and drink’ to the Ford Nation constituency; and even outside of that constituency there is likely to be large levels of popular indifference. Opinion polls to date do not reveal a groundswell of resistance from the people. The Toronto Star , on July 29, had this less than inspiring headline “Nearly half of Torontonians oppose Ford’s plan to slash city council, poll finds.” Opinions have not budged much since, even as various legal and other challenges have sprung up. The Ford regime’s radical and directed attack on the size of Toronto Council needs to be placed in some context. Ford, when he announced the plan to downsize the Council, referred to the fact that Los Angeles gets by with a council of 15 (with Ford ignoring that like most large cities with small numbers of councilors a borough system of governance below that). He could equally have mentioned Vancouver that has a mayor and 10 councilors. Ford’s Liberal and NDP opponents came back with arguments that if the same formula was applied to other parts of Ontario, Belleville (population of 50,000) would get zero representatives, Windsor would have 3, etc. The point is that Ford is not after Belleville and Windsor. He’s after Toronto and playing to his right-wing, anti-tax, anti-government populist base inside and outside Toronto. In some ways, the debate over the size of wards and municipal representation is similar to the debate over the “first-past-the-post” and “proportional representation” voting systems. PR may be formally a better democratic voting system than FPTP, but the absence of the former in Canada isn’t what’s holding back the election of a left-wing government. And a councilor in a ward representing 60,000 is better than one representing 120,000. But in itself changing the ward system is not going to get too many people agitated to take political action. The Conservatives also moved the goal posts in the middle of the game by inserting his electoral revisions when the campaign process had already begun. Clearly this is a direct attack on the formal procedures of democracy. But it hardly needs underlining that liberal democracy is already designed to disorganize working-class citizens and favour ruling class interests, and local democracy is no different. Indeed, it is notable how contained parliamentary opposition has been to such a sharp, directed, and arbitrary attack on Toronto’s local democracy. The national parliamentary parties have hardly said a word in deference to arcane Canadian constitutional principles that cities fall under the powers allocated to the province, with no constitutional status at all given to municipalities. At Queen’s Park, the debate over Bill 5 was formal and stage managed with Bill 5 passing predictably by the Conservative majority on August 14. Six days later, Toronto City Council voted, equally predictably but in a rancorous and sharply divided debate, by 27 votes to 15, to mount a legal challenge to Bill 5. In all this, Ford and the Conservatives at Queen’s Park have been decisive in taking action to consolidate his hold on the party and canny in how he has been selling his policies. He has been playing to his base and forming their partisan loyalty, but at the same time he has not provoked unnecessary opposition. So for example he got rid of the “$6-million dollar man,” the CEO of Ontario Hydro, as promised (even if the financial cost of the “resignation” is going to be much more than $6-million.) He effectively kept the promise to his conservative supporters on abolishing the revised 2015 sexual education curriculum for schools and returning to the 1998 one. But at the same time he has promised consultation, left some wiggle room for teachers, and yet appeased his base. Or that’s what it seemed. Perhaps in a Trump like moment, Ford decided that the base needed to be thrown some more red meat. On August 22, he announced what many consider to be a ‘snitch line’, a government website where disgruntled parents could report teachers who continue to teach the 2015 curriculum. “We will not tolerate anybody using our children as pawns for grandstanding and political games. Make no mistake, if we find somebody failing to do their job, we will act,” thundered Ford. On the climate issue, he’s again “keeping to his word” by getting out of Liberals’ cap and trade and announcing he will be making a constitutional challenge to the federal plan to impose a carbon tax on provinces that don’t have their own carbon pricing system. And it will be interesting to see how he proceeds with the cutting of the minimum wage. He needs to offer something to the small business component of his base, and the freeze in increases is a start (matched by the cuts to proposed increases in welfare rates). But he is probably aware that this is the one measure that could backfire and cause popular discontent given that 40% of PC voters were supportive of the $15 minimum. The radical revamping of the ward system in Toronto fits into the pattern of governance that Ford’s Conservatives have set. Act quickly and decisively; consolidate your base; expose the divisions and weakness in the opposition forces; and radically shift the political terrain toward a more neoliberal and authoritarian form of governance which it will be difficult for the opposition to reverse. The liberal Toronto Star has been predictably opposed to Bill 5, and even devoted a whole front page editorial to the issue and against the autocrat Ford. The Globe and Mail has also been opposed to the legislation, as have many columnists, but with a tone of “let’s find ways to cope”; the Toronto Sun stridently playing its role as the Ford Nation “paper of record” and backing the Conservatives moves; and almost all the on-line sites covering Toronto politics adamantly opposed to the cuts in the number of wards. the demographics reflected a mainly an NDP/Liberal, young, white, professional crowd that mirrored the same demographic as the anti-amalgamation movement led by John Sewell in the late 1990s. This will clearly need to shift to oppose Bill 5 and build a viable urban movement. the politics focused on the attack on democracy, but underplayed the political strategy of Ford playing to Ford Nation and beyond. Of course, the move should be denounced for the manner of its announcement, lack of consultation, and the hypocrisy behind it. Ford is all for savings and efficiencies and dubiously claims that reducing the size of Council would save $25-million. This has been repeatedly shown to ignore extra staff and support costs for councilors as well as city administrative costs. 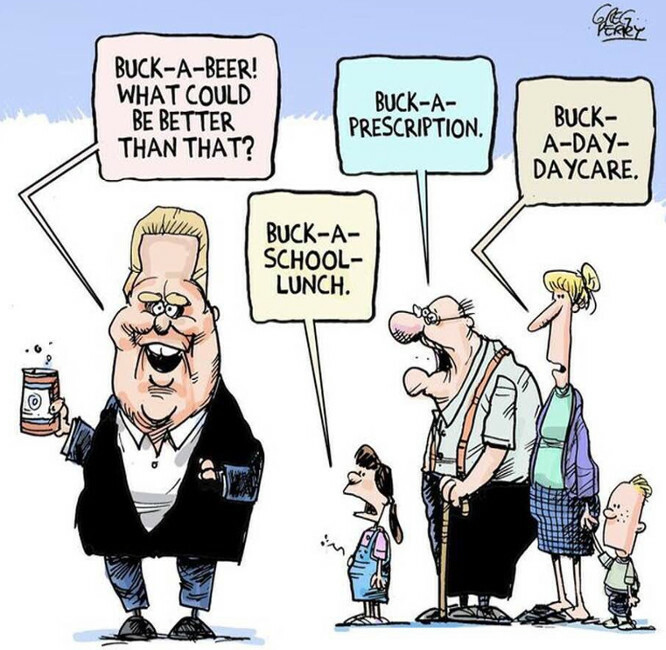 But Ford ignores the central duplication and inefficiencies in local governance in Ontario the two publicly funded school systems that could save $1.5-billion a year if amalgamated into one. the speeches by current city councilors opposed to the remaking of the wards often failed to escaped from, at times, a self-serving element defending Toronto’s local democracy in utterly idealistic ways. To listen to some of them, you’d think Ford had shut down the Council and sent all the councilors to the Ontarian gulag. A case in point is Councilor Joe Mihevc claims that Ford’s move was unfair because of all the work that candidates and incumbents had been doing for the past three months now counted for nothing, and likewise for all the work of City staff in redesigning new ward boundaries. This is far too a technical and formal response, as if more consultation (as Mayor John Tory continues to claim) would have resolved the political issues at hand. On the morning of Monday July 30th, another protest (organized largely through Facebook) was held at Queen’s Park. A small group milled around on the grounds outside Queen’s Park, and a slightly larger group went inside to listen to Question Period from the public gallery. But this proved how determined and aggressive the Conservatives will be in pursuing their hard right agenda. Doug Ford is a lot more nimble on his feet in answering questions and making his points than most people give him credit for. He and the Municipal Affairs Minister, Steve Clark, had no problem in swatting off Opposition questions. Despite the appeals about attacks on democracy, disenfranchisement, etc., it seems the prospect of popular opposition developing parliamentary sources is remote. The protest on August 3rd at Queen’s Park was led by NDP leader Andrea Horwath with several hundred in attendance (NDP parliamentary caucus and staff, some city councillors and a mixed crowd from there), but it is unclear what path of opposition they will pursue from there now that Bill 5 has passed. The NDP has followed its usual path of responsible opposition with no strategic course of building grassroots campaigns outside the legislature. Indeed, a fundraising appeal to assist “our MPP team” has been the focus – We are building a province-wide movement of people who are ready to stand up to Ford’s cuts. Will you be a part of it by chipping-in $3 or more now? Will you help support this urgent work? — without any clear course of action. The Ontario Federation of Labour has also provided little strategic direction, although they provided minimal support (with the affiliates hardly putting up a show) for the June 16 protest on defending the minimum wage and labour rights. The cuts and swift policy moves have made Ford’s austerity agenda clear enough, and some argue that we could see a replay of the 1990s fightbacks against the Conservative governments of Mike Harris. But we are far from the Days of Action stage of actions against the Harris government, and calls for an emergency convention of the OFL to prepare for sectoral and general strikes are remote at this stage given the state of the labour movement (the OFL sometimes seeming to do little more than sending out invitations to email one’s MPP about Ford’s misdeeds). 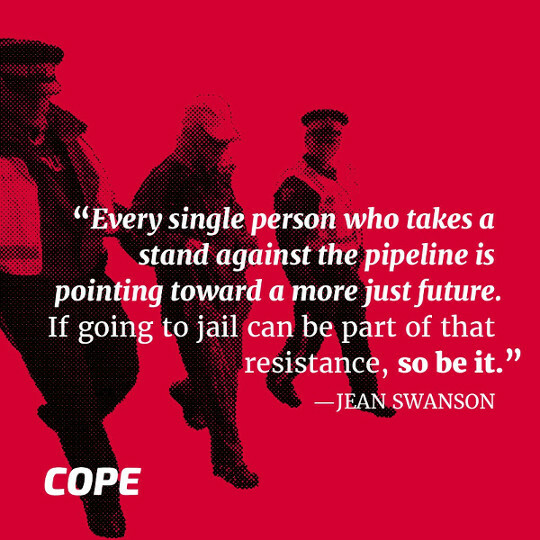 Both the OFL and the NDP do need to act, and it is necessary to begin mapping out resistance in the educational and healthcare sectors where important struggles are bound to erupt. On Bill 5 itself, the OFL is locked into strategy as righteous indignation rather than girding themselves for battle with a serious enemy. The Toronto and York Region Labour Council (TYRLC) has been more energized – they had a full discussion at their monthly meeting in early August and the summer issue of their journal, Labour Action , has a front cover titled “The Abuse of Power Begins” with a photo of an anti-Ford demonstration at City Hall that prominently features the placard “Hands off our Democracy.” However, even here, one senses that the TYRLC is not clear what strategy to pursue other than to follow the progressive block of Council in legalistic challenges. Indeed, the large meeting held at the Metropolitan United Church on August 16 co-sponsored by the TYRLC, brought a range of activist groups, the fledgling Progress Toronto electoral alliance (a largely NDP aligned group) and Labour Council behind the legal challenge without any further direction. Such a grouping could easily collapse into a loose electoral alliance of the centre-left for the coming election in the new wards, but it is hard to see what kind of common program could form or what it would amount to given the rather tepid anti-austerity opposition that the current progressive wing of Council has mounted to date. 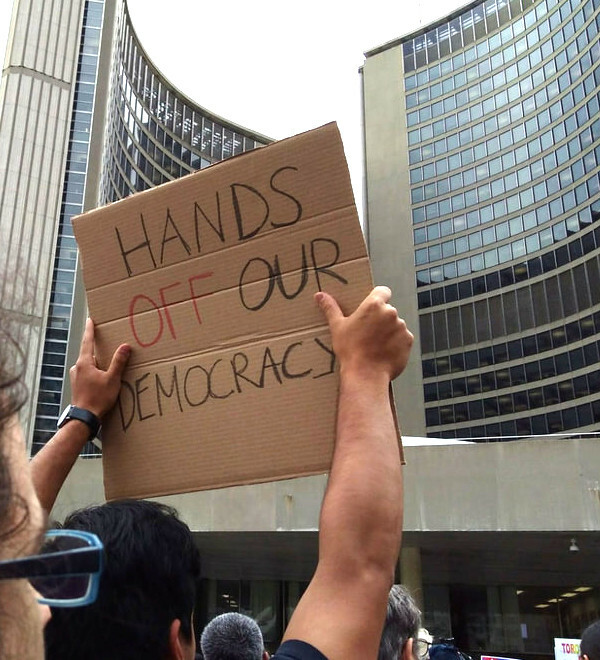 In thinking about the impact of the Ford attack on Toronto’s local democracy, of a senior government on a lower level government under its constitutional authority – it is helpful to initially make two points of political comparison to the dilemmas the Left in Toronto faces. Ford’s move against Toronto has often been compared in the last months to British Prime Minster Margaret Thatcher’s attack on the Greater London Council (GLC) in the 1980s. Although an interesting point to make, unfortunately, that comparison doesn’t work. It implies a similarity between the GLC under the leadership of “Red Ken” Livingstone introducing collective and participatory reforms and a Toronto Council led by John Tory locked into the policies of neoliberal urbanism. Has Tory done anything like introducing a “Fares Fair” policy for the TTC (the low income pass being an incredibly modest and clumsy effort of the last year)? Such a policy was implemented in 1981 by the GLC with a 25% cut in London transport fares subsidized by higher property taxes. Thatcher wanted not just to take on the GLC, she was after all left-wing municipalities, particularly those using “deficit budgets” to fund council housing (social housing) improvements, the most famous being the Militant led Liverpool City Council. Thatcher was explicit in her intentions with the 1983 Conservative manifesto promising to abolish the GLC as “a wasteful and unnecessary tier of government.” But the attack on London local democracy was also an explicit and crucial part of her project of neoliberalizing the British state. “My priority will be improvements for the people most in need. So end homelessness, then build social housing and a rent freeze for low and moderate income renters. People who are poor have a shorter life expectancy. A more equal society is life-saving. Winning these won’t be easy, but by working with groups across the city we can put pressure on the province to deliver. In Toronto, there is a large political space now opened up by the fight over the restructuring of the wards system for the Left to consider. It is not too late for an independent Left run (if not for mayor, in a few targeted wards, with even a wider slate to consider pushing). The new deadline for submitting one’s name as a candidate is September 14. It is quite possible to argue that Ford’s move favours the idea of an independent socialist campaign. And this in full knowledge that the NDP/Liberal left will probably be calling for a vote for centrist Jenifer Keesmaat as the best way to defeat Tory and that at ward level, they will be doing the math and putting all their eggs in the one basket for the “progressive” candidate they see as the most electable (although a few other candidates may merit some support as well). Right now, this would mean coming to agreement on a basic platform around housing (rent control, building more social housing, contesting speculative ownership), for expanded and affordable public transit, taxing the rich, and a radical expansion of urban public health resources. From that, hopefully new candidates would put themselves forward to run in the ridings where they live or we find candidates who have already declared and are willing to accept the aforementioned platform. Maybe a slate of candidates will emerge. Canvassing squads would then be organized to take this agenda across as many wards as possible, in addition to intense targeting of a few key wards, we would need to develop a strategy to push union locals to take up these demands and this could link back to local democracy, not necessarily calling for a return to a 44/47 member council but perhaps a model of elected councillors and neighbourhood councils as in the Los Angeles example. Ford and his Conservative government are clearly dangerous and represent a real threat to the working class, immigrants, women and youth in Ontario. He has yet to played his full hand. So, here’s a caution for the Left: step back and take in a panoramic view of the forest and less of the trees. The cut to the size of the Toronto council is an important battle but not the hill to die on. A case in point is the continued mobilization of the far right (given further oxygen by the Ford election victory), and counter-protests against the racist right should be a high priority for all the Left, particularly as the far right politics being fueled by Trump in the U.S. and gaining ground in Europe continue to build. But, there are other more crucial areas of struggle that need to continue to gain in organizational capacity – the “Fight for $15 and Fairness” is one of the most important organizing groups in the city and is still doing tabling, door knocking and lobbying in Toronto and across Ontario, and one could cite similar activist work to contest healthcare cuts, or push for public transit, or fighting poverty. Greg Albo teaches political economy at York University, Toronto.